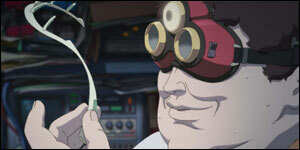 In the recent Japanese anime movie Paprika, a brilliant researcher named Tokita Kohsaku perfects a small device - the DC Mini - that allows psychotherapists to not only see, but also enter, the dreamworld of their patients. Scientists at the Advanced Telecommunications Research Institute International (ATR) in Kyoto have developed a way to actually see the images in the brains of dreamers. "By applying this technology, it may become possible to record and replay subjective images that people perceive like dreams." The scientists, lead by chief researcher Yukiyaso Kamitani, focused on the image recognition procedures in the retina of the human eye. Read more about how to Extract Images Directly From The Human Brain and the Telegraph. While you're waiting for this research to progress a bit further, take a look at this video of the Sleep Waking robot use interpretive dance to describe your dreams. Thanks also to an anonymous reader who pointed out this aspect of this remarkable research.